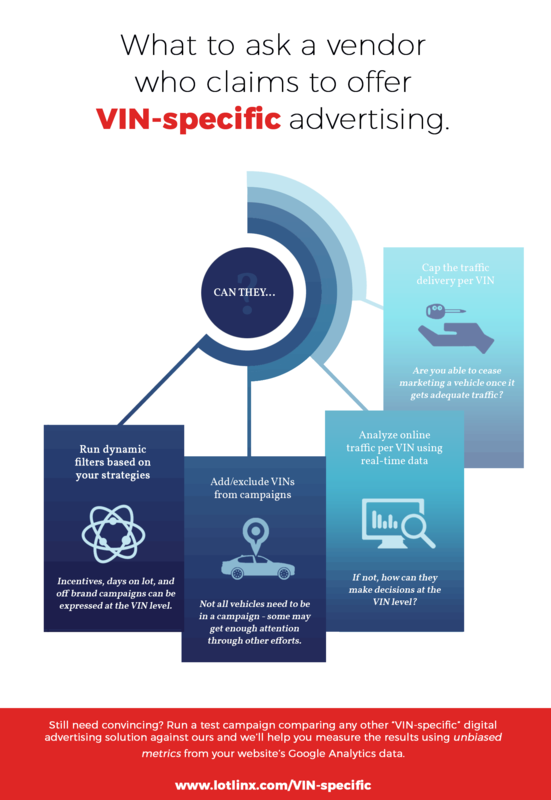 LotLinx is the pioneer in the concept of VIN specific marketing. I remember in the early days of LotLinx people would be surprised that we were landing on the vehicle details page (VDP.) The only concerns were that the bounce rate might be too high! Well, a lot has changed since those early days and dealers are now being presented by other companies who claim to have VIN specific capabilities. It’s important for dealers to validate that these vendors are actually able to deliver TRUE VIN specific capabilities – not simply landing on the VDP. Let’s take LotLinx for example. Every so often, a vendor will claim to offer “VIN Specific” products or services that claim to be similar or better than our technology. 1. Do they have a tool available that allows you to analyze the online traffic generated by current marketing activity, sees how much traffic each VIN is getting from every digital channel, and make inventory-based decisions accordingly? If they cannot, how can you make decisions at the VIN level? 2. Can they exclude VINs from campaigns? Not all vehicles in your inventory need to be in a campaign. Some may be getting enough attention through other marketing efforts – such as SEO. Why run campaigns on those? 3. Can they run dynamic filters like incentives, days on lot, off-brand campaigns? Inventory-specific strategies are important. Can you heavy up on vehicles that need help? Can you focus more budget on the VIN with dealer cash? Every dealer have inventory strategies that can be expressed through VIN level marketing. 4. Can they have a VIN cap on shoppers? We know that most vehicles only need 30 shoppers or so. Are you able to cease marketing a vehicle once it gets adequate traffic? These questions can start to show a dealer the difference between imitators, and the real deal that is LotLinx technology. If you have any questions regarding the capabilities of LotLinx /AI/ powered campaigns, don’t hesitate to reach out. About the author: Lance Schafer joined the team in April of 2015 and serves as the General Manager of Product and Technology for LotLinx. He helps lead and direct the Product and Technology team in the creation of valuable products for the Automotive Digital Marketing industry. 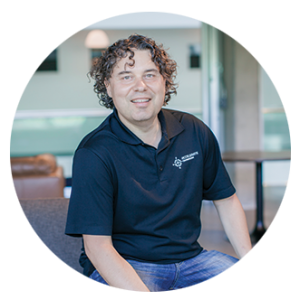 Combining his Digital Marketing and software development expertise, Lance helped introduce machine learning to LotLinx’s massive ad network and co-developed a technology patent. Lance, who is based out of our Canada office, came to LotLinx following a 20-year career managing investment opportunities in the technology and digital media spaces. Having an entrepreneurial spirit, Lance has been CEO and Co-Founder of many business ventures, including co-founding LemonFree.com – a comprehensive online automotive shopping and research marketplace. LemonFree.com went on to be acquired by LotLinx in 2015, thus bringing Lance to our team. He has a Business Degree from the University of Manitoba.